With MLS for Apple TV, fans of the game have access to the latest news, highlights, standings, and analysis all for free. Score! With MLS for Apple TV, you'll never miss any of the action from your favorite team and others around the league. From start to finished, this app has it covered. Now this is real "football." 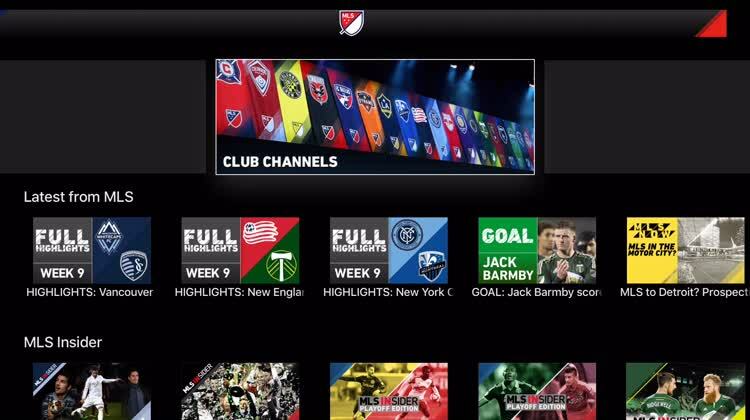 MLS LIVE augments existing TV options by providing access to hundreds of out-of-market matches. It is the perfect option for following players on your fantasy team, scouting an upcoming opponent, or watching your home team while you are out of town. Do you like soccer, but don't always know when your favorite team is playing? Get MLS for Apple TV; you'll be happy you did. The official app of Major League Soccer keeps you connected with the latest news, highlights, scores, standings, and analysis all for FREE. • AirPlay support - Stream videos and MLS LIVE to your TV. • Chromecast support - Cast videos and MLS LIVE to your TV. • Five years of highlights and archived matches within the web version of MLS LIVE.